You might be familiar with the term “found time,” which refers to time that unexpectedly opens up in our schedules–when a flight is delayed, when an appointment is canceled, when we miraculously finish the to-do’s on our list before we thought we would. Because one of the greatest obstacles to writing (and for me, to reading) seems to be finding time for it, it’s imperative that we A) find time and B) use found time to its fullest potential. While we’re all always incredibly busy, we might have more found time in our schedules than we realize, and we can use this time to support our literary lives, even with the rest of life seems to be getting in the way. If you find yourself eating a meal unaccompanied, write or read while you eat. You have to sit down and be still anyway–you can’t clean the house or go for a run while you eat–so it’s a great time to get out your laptop, journal, diary, or book and write or read. Plus, it makes you eat more slowly, which I’ve read is good for your health. In order to use found time, you have to be prepared to use found time. If time opens up in your day, but you don’t have the tools you need to use it (your book, pen, notebook, laptop–whatever), you’re going to be hard-pressed to be productive. For this reason, bring a notebook and writing utensil or your latest read with you everywhere. Then, when unexpected time arises, you can use it to write or read. Read or write when you use the bathroom. It might sound crass and it’s probably not hygienic, but it works. No one is going to bother you while you’re in there and, as with eating, you’re sitting down and being still, anyway. Take advantage of the time! What else are you gonna do with it (I mean, besides a No. 1 or a No. 2)? Or at least say you’re going to bed. Then, spend 15 to 30 minutes writing or reading before you turn out the lights for the night. For writing, make a list of topics, experiences, ideas, or memories you know you want to write about. That way, when you end up with a little unexpected time, you won’t have to waste any of it wondering what to write about–you can just pull out your list and pick from it. While our lives are inevitably busy and sometimes chaotic, little pockets of time unexpectedly open up in our schedules now and again. When they do, be ready to use them to nurture your love of writing and reading! As writers, we like to tell stories. Unfortunately, some of the most frequent stories we tell ourselves are probably about how we don’t have time to write. Or how we’re stuck in a rut, the dreaded writer’s block having taken hold. Or we’re no good at writing. Or we don’t have any ideas worth writing about. The list of stories about why we’re not writing–even though we love to write–is a long one. But these aren’t the stories we have to tell ourselves, and they’re certainly not very fun stories to write (or read). Even when you’re busier than busy, battling writer’s block (or letting it win), feeling insecure, or facing a seeming dearth of ideas, there are lots of things you can do to maintain your cherished identity as a writer, and flex your writing muscles. Once upon a time there was a teacher named Mrs. Creasey (that’s me!). She brought home hours of papers to grade almost every night, trained for half marathons, cared for her dogs, managed her household, volunteered once a week at a local no-kill animal shelter, and worked part-time at a local YMCA to supplement her income. You might imagine that Mrs. Creasey found little time for her writing, and you’d be right; it felt like a leisure activity for which she simply did not have the time–but she wished she did. Despite being so busy, Mrs. Creasey often missed writing, and lamented the months that would pass between even her diary entries. Truly, it was shameful. Fortunately, Mrs. Creasey eventually realized there were lots of ways she could carve out time to make writing a priority, and she still does–to this day. When I realized I was no longer making time for my writing, and how much I ached to do so, I decided the best way to make it a priority in my schedule was to get my graduate degree. If I had money wrapped up in it, and homework to do–I would make time. And I did. Earning my graduate degree in creative writing forced me to make time for writing in my busy life–and I was happy to do so. My writing became an obligation, and one I was glad to assume. No one–including myself–questioned me when I said I had homework, so I gladly made time to sit down and write the poetry, personal essays, creative nonfiction pieces, and short stories assigned to me. As an added bonus, my income slightly increased once I completed the degree. My writing became an obligation, and one I was glad to assume. No one–including myself–questioned me when I said I had homework, so I gladly made time to sit down and write the poetry, personal essays, creative nonfiction pieces, and short stories assigned to me. If earning your degree seems too big a commitment, you might consider something a bit less demanding, like a single class or a workshop, which can yield some of the same benefits. Participating in a class or workshop provides you with a structure in which to write. If your daily schedule seems to make carving out writing time difficult, taking a class or workshop gives you the peace of mind of knowing that on Tuesday nights from 7:00-9:00 (or whenever your class/workshop takes place), you will be able to dedicate two (or however many) glorious hours to your craft. Last week, my friend Renee, who lives in Alaksa, spent some time in Richmond. On the final evening of her visit, we participated in a two-hour Life in 10 Minutes writing workshop. Some of my favorite workshops in the Richmond area have been Life in 10 Minutes, the novel-writing class in which I am currently enrolled at the Visual Arts Center of Richmond, and James River Writers Master Classes and Writing Shows. It’s amazing what you can find time for if you’re getting paid to do it and you love to do it. One way to make yourself make time for writing is to find a way to get paid for it. Check out platforms like Contently, subscribe to (and read) the Freedom with Writing e-mails, contact your local newspapers, network with other writers, take a class on freelance writing… There are lots of ways to make a little (or a lot of) money with your writing. In a land far, far away, there was a writer who couldn’t write. She had ideas–lots of them, but putting them into words–turning them into stories or poems or books–was a task that seemed impossible. She begged her muse to help her, but her muse seemed to have been on vacation for a long time. A very, very long time. Eventually, she realized that she was going to have to write–muse or no muse. And she tried some of the tactics below. One way to write even when your muse seems to have deserted you is to keep a diary or journal. Don’t burden your entries with purpose or expectation–just write about your thoughts, feelings, or day. Attending a conference can have a way of summoning your muse right back from wherever she has been hiding. Some of the most inspiring events I have attended include those put on by the Poetry Society of Virginia, and the James River Writers Annual Conference. Reading can prove an extremely effective way to inspire ideas–so read your books (and write in them). One place to start is this blog post about books every writer should read. Making creative friends is a great way to nurture your own creativity. Fellow creatives can support you, point out what’s good in your work, and give you feedback to inspire your progress. You can also share your work with each other. Surrounding yourself with people who believe in you is a surefire way to make yourself feel more valid in your craft. There are lots of ways to find creative friends. Consider joining a writing group such as Virginia Outdoor Writers Association, Poetry Society of Virginia, James River Writers, or a critique group. Taking writing classes or workshops is another great way to meet fellow writers. Another way to prove to yourself that you are, indeed, a “good writer” is to submit your work to journals, contests, and publications. Admittedly, this practice also opens you up to significant risk, but it gets your name out there and helps you feel validated. Plus, the recognition you earn when a piece is published or wins an award is rewarding, to say the least. And even if you meet with rejection at first (or often), I find that having work out there gives me hope. The more pieces I send out to publications, the higher their chances of finding a publication home (in my mind, anyway). I like the feeling of my work floating around out there. I like the anticipation. The fact that I have writing to send out means, at least, I am writing. Once upon a time, there was a teacher named Mrs. Creasey (that’s me again! ), who had a sticker on her classroom door so she would see it every single morning when she unlocked the door to go to work. It read: “And by the way, everything in life is writable about if you have the outgoing guts to do it, and the imagination to improvise. The worst enemy to creativity is self-doubt” (Sylvia Plath). Mrs. Creasey loved this quote–for her students and for herself. Another of her favorites? “It’s not what you write about, but how you write it.” Both of these quotes hold true for anyone who wants to write. You can write–you have the ideas. You just have to, ya know, do it. Once upon a time, there was a writer who loved to write, and who wrote all the time–but who often felt discouraged because he was certain that despite his best efforts, no one actually wanted to read what he wrote–even if it was really, really good. It seemed no one cared. And besides–writing isn’t like a painting or a photograph or a sculpture, easy to display and share. It requires some effort on the reader’s part, some willingness to invest time, energy, and thought in the piece. Who was going to do that when they could simply watch TV, play games on their smart phone, go to the movies, or do any number of easier activities? One way to combat the sense that no one is interested in your writing is to start a blog. At least a few people will read it, and that’s nice. Plus, maintaining a blog can help hold you accountable to your writing. Knowing you have even a small audience who might be waiting for your next post can be motivation to write the next post. Besides, it feels empowering and validating to have an online presence, albeit a small one. Using social media outlets such as Facebook or Instagram can help grow your audience for your blog–or any other writing you do. Just be careful not to allow your social media accounts to steal time away from your actual writing. While the above advice is nice, and can prove productive if you need a pick-me-up or a way back into writing after a hiatus or a blow to your confidence, the most important thing you can do for writing is actually write. It will be a struggle sometimes, but nothing worth doing is every easy (at least not all the time). This spring, I was privileged to attend a workshop led by Dana Isokawa of Poets & Writers Magazine in Richmond, Virginia, at St. John’s Church (pictured above). Edgar Allan Poe’s mother is buried in the churchyard. Earlier this month, I posted a piece about what to consider when you prepare to submit your writing to literary magazines and/or writing contests. Now, let’s focus on considerations you should make depending on the type of writing you do. Before we break down what to do when submitting poetry versus prose, there are some general rules of thumb to follow for any genre. The following tips come to you from Dana Isokawa, Associate Editor of Poets & Writers Magazine. In April, I was fortunate enough to attend a workshop she led in Richmond. She provided some really helpful advice. Research your opportunities. Figure out what publications or contests are out there, and which might be the best fit for your work. After you’ve done that, tier your top choices and start high! When you applied to college, you likely applied to a dream school or a reach school, as well as several backup schools. When you submit your writing, you can use the same principle. First, submit to your absolute top choice contest or publication, but have some second and third choices in your back pocket. Keep track of your submissions. Some publications allow simultaneous submissions. Some don’t. Even those who do will likely request that you let them know if your work is accepted elsewhere. For these reasons, and others, it’s important to keep records of where you’ve sent your work, and whether or not it was accepted. Decide on a budget for each piece. What are you willing to spend on submissions in total, and on each individual piece? Compose a cover letter. Keep it short, and be specific to each publication or contest. If you’re submitting to a journal or magazine, you will also want to devote one or two sentences to explaining why your work is a good fit for the magazine. For most journals or contests, select three to five poems of various tones, lengths, and topics. Some journals and contests require a specific number of submissions, or cap the number of submission you may send, so be sure to read the submission guidelines carefully. When you submit a batch of poetry, think of it as a whole, and organize your submission wisely, with your best work at the beginning. Think of your first poem as the hook that will get the reader’s attention, and entice her to read more. Before submitting a short story to a contest or publication, make sure it features a strong beginning, or hook. A strong start is absolutely critical, as you’ll need to get and keep your reader’s attention. After all, she likely has a stack of other stories waiting for her time and focus. Ms. Isokawa suggests two effective ways to craft a strong start: Begin with action, or write with really strong voice. When you submit a novel excerpt, your chosen piece should be able to stand alone. A flashback or decision scene might work well. You can also consider adapting an excerpt of your larger work by taking out references to parts the reader won’t get to read. Should you be fortunate enough to find a publication home for your work or for your work to be honored with an award, be sure to thank the editors, and share the journal, publication, or contest on social media. They’re helping promote you; help promote them. If your work is not accepted, you might still be lucky enough to get a rejection with feedback. If an editor is kind enough to provide any feedback at all, say thank you–don’t ask for more feedback. If you ever resubmit to a publication that has previously rejected but offered feedback on your work, be sure to mention their note with your new or revised submission. Don’t allow rejection to discourage you. Try again. Even the most celebrated writers have dealt with rejection, and many still do. To help combat the temptation to give up, always have a piece of writing “in waiting” or “on deck,” one you can send out to contests and publications as soon as its predecessor gets rejected. Writing of her spiritual journey, Mary Baker Eddy explains that she “finds the path less difficult when she has the high goal always before her thoughts, than when she counts her footsteps in endeavoring to reach it. When the destination is desirable, expectation speeds our progress.” Her wise words can be applied not only to a spiritual search for salvation, but also to our writing goals. The guidance supplied in this quote can help us battle writer’s block, discouragement, rejection, and the temptation to quit, born of these ills. My confidence is a pendulum constantly swinging between two extremes: doubt and delusions of grandeur. I find Mrs. Eddy’s words helpful whenever I feel myself succombing to the sense that my project isn’t worthwhile–no agent will want to represent it, no publisher will find it marketable, no reader will want to read it. We all face these insecurities. For me, they are as frequent as their opposites: I am writing the next Great Novel. It will become a best seller and a major motion picture. I have something valuable and worthwhile and unique to say. My confidence is a pendulum constantly swinging between two extremes: doubt and delusions of grandeur. While it’s easy to keep writing when the latter thoughts fill my mind, perseverance in the face of such negative self-talk as the former thoughts proves a bit of a struggle. But keeping Mrs. Eddy’s words in mind helps. For my writing, the “high goal” right now is seeing my novel published. The “high goal” is the satisfaction of knowing something I wrote is making people think and rethink, question and wonder, read and reread. The “high goal” is inspiring new ideas, even long after I’m gone. One current obstacle to this goal: My novel isn’t even finished. But step one is there: I have set the goal (and started writing the novel). Instead of letting disheartening thoughts of doubt cloud our thinking, instead of wondering why we even bother, instead of letting the footsteps we must take feel arduous and grueling, rejoice in the fact that you are taking the necessary steps towards reaching that glittering goal, whatever it may be. listened to Podcasts or read articles relevant to my topic. It can be easy to get bogged down in counting these steps, as Mrs. Eddy warns against. But when we find ourselves feeling buried by little things, it truly can be helpful to take a step back and remember the bigger picture, the higher goal. Instead of viewing revision as a chore, or dreading working on your project because you’re in the tight-fisted grip of writer’s block, remember that your “destination is desirable,” and the “expectation of good speeds our progress.” Instead of letting disheartening thoughts of doubt cloud our thinking, instead of wondering why we even bother, instead of letting the footsteps we must take feel arduous and grueling, rejoice in the fact that you are taking the necessary steps towards reaching that glittering goal, whatever it may be. Remember that each revision, each belabored chapter rewrite, each late night writing and rewriting–they are all part of the process. Instead of dwelling on each difficulty, take pride in your progress. As long as you don’t lose sight of where you’re going–as long as you keep the high goal always before your thoughts–each footstep takes you a little closer to where you want to be. When I was working on my capstone project for my graduate degree back in 2013, my husband came home from work one day to find me surrounded by books, index cards, highlighters, and notebook paper. I was scribbling away–in pencil–in one of the books. My potty-mouthed, inked-up, motorcycle-riding husband was horrified. I looked up from my pile of research materials. “Yeah,” I said matter-of-factly. The note “animals don’t know they take ppl to hang,” hastily jotted down in my copy of The Crucible as I read with a group of students one day, ultimately inspired my sonnet, “Salem’s Indifferent Ox,” which will be honored with a second place award in the Nancy Byrd category of the Poetry Society of Virginia‘s Annual Awards Luncheon later this month. I don’t see writing in books as delinquent or destructive. I see it as proof of engagement with the text. But I can, and I do–all the time. I write in almost every book I read. You’ll never find me reading a book without a pen in my hand. All of my books look like they’ve been through the wars. Their pages are dog-eared (I use bookmarks to mark my spot, but I dog-ear pages to mark spots I want to revisit). Their margins are full of scribbled questions, ideas, inspirations, criticisms, and exclamations. Words are underlined. Typos are corrected in blue or black pen. If they’re paperbacks, their spines are cracked and broken. They are well-loved, if not ratty. I specifically remember the very cynical notes I read in my used copy of Vivian Gornick’s The Situation and the Story: The Art of Personal Narrative. It was as if the reader who read the book before me were quipping back at Gornick’s every idea or assertion–a disgruntled child talking back to his mother under his breath. For years, I figured everyone read like this–pen in hand. How could it be otherwise? How could anyone resist scratching down an idea inspired by a passage, or underlining a particularly delicious turn of phrase? How could anyone not circle an unfamiliar word for later exploration? How could anyone read actively, critically, or analytically without writing in her books? Impossible. It was only recently I found out I was wrong–and that a group of readers very unlike me exists. My fellow blogger, Charlene Jimenez, of Write. Revise. Repeat., is one of them. These readers refer to readers like me as “monsters.” Readers like me destroy our books as we devour them. We can’t help it; it’s how we read. If monsters only dog-ear pages, I am absolutely the most villainous ogre imaginable. 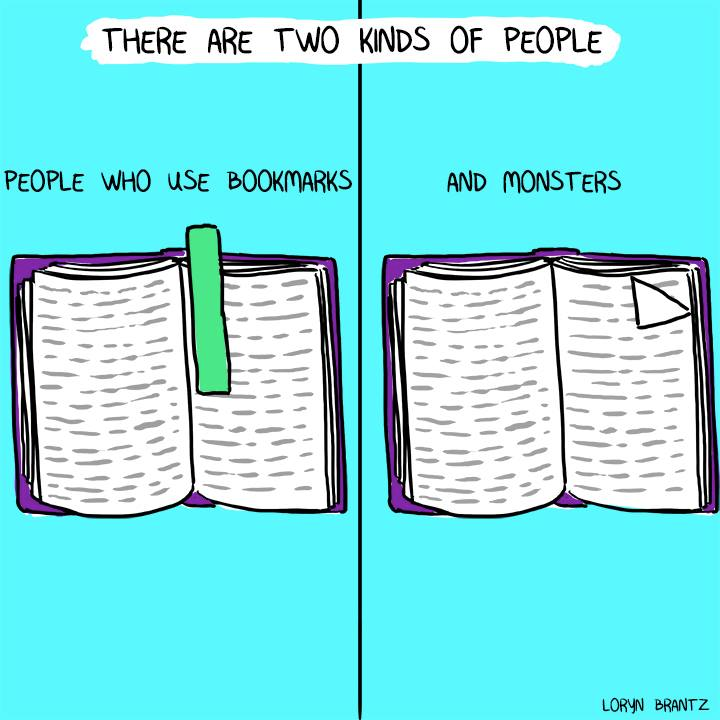 In addition, I actually enjoy reading books fellow monster-readers have written in. I like reading their notes almost as much as the book they pertain to. I feel like I am having a conversation not only with the author, narrator, and characters–but also a like-minded friend, one who writes in her books–just like I do. Sometimes I agree with the previous reader’s assessment; sometimes, I don’t. Oftentimes, I feel like I get a sense of who the person behind the notes is–her outlook on life, her general mood, her beliefs and questions and insecurities. I specifically remember the very cynical notes I read in my used copy of Vivian Gornick’s The Situation and the Story: The Art of Personal Narrative. It was as if the reader who read the book before me were quipping back at Gornick’s every idea or assertion–a disgruntled child talking back to his mother under his breath. While I agreed with very few of the marginal notes that graced the pages in a fading, gray pencil scrawl, I found them amusing–and they told me a lot about the previous reader. My copy of John Steinbeck’s Of Mice and Men is peppered with notes regarding things I want to make sure I address with my students–stylistic techniques, literary devices, etc. Despite the disdain it apparently draws–from bibliophiles and bibliophobes alike–I won’t stop writing in my books. Not out of obstinacy or spite–but out of necessity. I don’t see writing in books as delinquent or destructive. I see it as proof of engagement with the text. I don’t read like a monster; I read like a writer. Despite the disdain it apparently draws–from bibliophiles and bibliophobes alike–I won’t stop writing in my books. I don’t read like a monster; I read like a writer. If you enter the front door of my house, mount the stairs, and make a left, you will find yourself in the room my husband and I call “the office.” Despite its mundane name, the office serves a myriad of functions: It’s my husband’s video game room, our catch-all room, and my writing room. It even served a short stint as a guest room at one point. Opposite a massive television that dominates an entire wall of the office, sits my heavy, wooden desk, its broad surface all but covered with magazines, books, candles, a few photographs and business cards, a mug full of pens, and my laptop. I was pretty proud of this little space–this tiny portion of the room that was mine–when we first set it up. For a while, I even started referring to the office solely as “my writing room.” Truth be told, though, my husband plays far more video games in there than I write articles, poems, essays, or stories. And so, gradually, the room has returned to its original name: the office (though maybe “gaming room” would be more appropriate). I do write there occasionally. It’s a cozy, quiet spot–and it’s nice to have all my writing materials handy (if not 100% organized). I’ve found, though, that despite my loving the idea of a writing room, I’m a fairly migratory writer. I write at the kitchen table. I write at the table outside on our back deck (a lot). I write on the couch. I write perched on the edge of the brick hearth in front of our fireplace. I write sitting in a gravity-free chair beside the fire pit in our backyard. I write on rocks in the middle of the Jame River. I’ve even been known to write during a float session and in an inflatable, backyard pool. Each of these locations offers its own set of benefits and drawbacks. Each environment contributes to–or, in some cases, detracts from–the creative process in some way. One of my favorite places to write is outside–anywhere outside. My back deck, my front porch, my hammock, the river, the beach… I find writing outside in the natural world offers a plethora of benefits. My mind is free to wander through the open space of fresh air, tangled tree branches, birds on the wing. Nature seems to help open up my creative pathways and free my imagination. The advantages I find to writing outside are many. The natural world offers stimulation for all five senses, and often, unexpected inspiration. My essay, “Out Of Touch,” was inspired in large part by an experience just lounging on my hammock in the backyard. “The moon was late to the party” came of an experience I enjoyed on two consecutive nights of evening walks. I wrote a large portion of Goodbye for Now on my back deck. The outdoors also offers a way out of ourselves–transcendental experiences that seem to allow us a wider sphere of perception and thoughtfulness, and a broader scope of imagination. Being at one with nature puts me in a meditative state that is more open to ideas than my usual, task-oriented mind. Writing outside offers a way out of ourselves–transcendental experiences that seem to allow us a wider sphere of perception and thoughtfulness, and a broader scope of imagination. In addition, if you’re falling victim to writer’s block, one way to overcome it is to step outside and observe nature. Focus on each sense individually, and describe, in detail, what you see, hear, feel, taste, and smell. Some of my most original and pertinent lines, phrases, ideas, metaphors, and similes find me when I’m outside. There are, however, a few drawbacks (none of which outweigh the benefits, if you ask me). Kris Spisak, author of Get a Grip on Your Grammar: 250 Writing and Editing Reminders for the Curious or Confused, says she writes “outside a lot, but I can’t edit there if I’m in fine-tuning mode. The glare on my screen lets imperfections slip through undetected.” Sun glare on a laptop screen can indeed be pretty brutal sometimes, and outdoor situations are not always the most ergonomic. Plus, writing outside is obviously weather-dependent, so it’s not always a feasible option. Finally, sometimes I myself tend to get caught up in my surroundings, and end up doing more observing and appreciating than writing. Somehow, writing in a coffee shop has the effect of just magically making me feel like a bona-fide writer. I’m not sure why, exactly–but I feel legitimate when I write in a coffee shop. (Or itwould, I imagine, if I ever wrote in a coffee shop…) Another plus is the people watching you can manage in a bustling coffee shop can help inspire character ideas, and the conversations you can overhear can help inspire dialog. All that said, I myself rarely, if ever, write at a coffee shop, though a Starbucks sits at the main intersection just two miles from my front door. I once took a conference call there, and nearly a decade ago, I graded a stack of research papers there–but I can’t recall having ever actually written anything there. Who doesn’t like curling up with a good book (whether you’re reading it or writing it is beside the point) on a comfortable couch or chair? I mean, it’s comfy! So comfy, in fact, that you’re not likely to want to get up soon–so you’re likely to stay there a while and keep writing. Charlene Jimenez, a writing instructor and freelance writer, says she likes writing in a comfortable chair or on a cozy couch because “it’s nice to physically relax when you’re working your creative writing muscles. The main drawback for me? I sometimes get a little too comfortable and end up giving in to the urge to nap. Setting up a certain space designed just to help you write can help condition your mind and writing muscles. You know that when you enter that space, you write. Similarly, people know not to disturb you; you’re working. One drawback, however, is that while a home office may help you focus, it may not be particularly stimulating or inspirational (or it may make writing feel like, well, work). Jimenez wrote most of her NaNoWriMo novel on her back porch, where her husband had just hung some beautiful lights, making the space peaceful and inspirational. Spisak, too, has a balcony she calls her “warm-weather office,” explaining she enjoys “the fresh air during my work time. Something about a nice breeze and birdsong can be inspirational.” I’m with you there, ladies! I love the different perspective offered by an elevated porch or balcony. I can see more, and see it all differently, lending me new ideas, stimulation, and inspiration. Wherever you do most of your writing, I hope it offers the inspiration and motivation for your best work. This past weekend, another couple helped my husband and me paint the foyer in our nearly century-old vacation home, leading to a discussion about various art forms, from writing to painting. While I don’t have the patience to actually paint the detailed woodwork featured in the foyer, and while the work in the above photo is unfinished, I’m proud of my vision, albeit executed by a more detail-oriented friend. re-purposed materials and has recently begun creating beautiful stained glass pieces. And I? Well, I identify mainly as a writer, though I dabble in painting and amateur photography from time to time. As the four of us painted the front foyer of our 1919 farmhouse, my friend gave me candid feedback on my novel, which I recently asked her to read, giving her free rein to rip it apart if necessary. She gave me some really insightful advice, and admitted she felt relieved that I had taken her constructive criticism so well (granted, she did an excellent job tempering her criticisms with compliments, but I digress). One of my husband’s latest artistic endeavors includes making stained glass pieces. This one hangs in a friend’s kitchen. She followed her critique of my novel with the admission that she had decided she was no longer going to identify as a writer, in part because she needed more validation than she felt writing could offer her, and in part because writing simply offers less tangible and fewer results. When you paint a wall, for example, you can see the effect of your efforts almost immediately–as proven by the way our foyer brightened up with every coat of paint. When you write a story or a novel, the progress is often much slower, and much less noticeable. In addition, while a newly-painted room is sure to get oos and ahhs, a story or novel is likely going to face dozens and dozens of rejections before it ever sees an acceptance (if it ever sees an acceptance). You can show people a painting, a sculpture, a photograph–and they need only seconds to get at least a cursory appreciation of your work. But someone has to invest a lot of time and energy to read your poem, story, essay, or novel. And lots of activities vie for our time and attention. Writers compete for an audience with TV shows, movies, sports broadcasts, sleeping, errands, etc. We must not only write our story, but then convince people to commit their limited time and energy to reading it. After all, more energy and time are required to read a book than to look at a piece of artwork or watch a film or play. Plus, producing a tangible product, like a painting or a sculpture, can be satisfying. You can display it. You can sell it. You can hold it, gaze at it, touch it. All of these things are much more difficult, if not impossible, to do with a poem or novel–not to mention the fact that a written work never feels finished. We feel always like we could find a more perfect word, more effectively structure our chapters, more expertly develop our characters or write our dialog or set our scene or or or…. At a certain point, we just have to decide it’s done, whereas other artistic endeavors we can more definitively finish, and that completion is satisfying and fulfilling. For the first time in my life, I am painting a piece of furniture. So far, so good! While I love writing, and identify as a writer, finding new creative outlets is satisfying. For the first time in my life, I am painting a piece of furniture. So far, so good! While I identify as a writer, finding new creative outlet is fulfilling. I understand what my friend is saying. I have often questioned my drive to identify as a writer. Is it really necessary? Why do I care so much? Why do I write? It’s really hard, and I enjoy many other forms of creative expression–painting, singing (though I can’t say I’m any good anymore), sketching, design, photography, and even theater at one point in my life–and these open me up to far less criticism and rejection. As a writer actively seeking publication, rejections have become routine for me. Getting published is like winning the lottery–just as rare, but just as thrilling. I think maybe that’s one reason I keep writing: It’s hard (really, really hard sometimes), but the sense of accomplishment and elation I experience when a publication accepts my pitch, when I see my work in print or on-line, or when I get that long-awaited paycheck for an idea hatched a year before, far outshines the sense of disappointment that accompanies (yet another) rejection. Maybe I have come to accept that rejections are part of writing–at least for someone who seeks publication. I am no less a writer for having become more familiar with a sense of resignation at another thanks-but-no-thanks than with a sense of validation and accomplishment. In fact, another rejection at the very least means I’m producing enough work–enough writing–to send out into the world. The real fear sets in when I haven’t written anything new in a while–when my list of rejection e-mails shrinks because of a dearth of ideas, a sort of writing drought. My fear of having nothing to write far outweighs my fear of rejection. So, really, maybe that’s how I know I’m a writer. Above, you can see the many rejections my desire to write has recently survived. With persistence and resilience, I have manged to find homes for some of these pieces. My fear of having nothing to write far outweighs my fear of rejection. So, really, maybe that’s how I know I’m a writer. Maybe he could make more of the next 23 hours … if he weren’t so aware of the minutes peeling away like sheets on a desk calendar. Her pen moved slowly, like her morning thoughts. To help express the character’s sense of time passing too quickly, the first example draws a comparison between minutes passing and the sheets on a desk calendar being ripped away and discarded. The second example compares the pace of the writer’s pen to the pace of her thoughts–both slow in the early morning hours. …the sky had exchanged its vibrant afternoon blue for a pale lavender nightgown. In the above example, dusk is compared to (almost equated with) a “pale lavender nightgown” the personified sky dons before nightfall. When a writer employs a simile, she allows for a degree of separation between the items she compares. They are similar, alike–but not the same. By contrast, a metaphor essentially equates the items it compares. When a writer uses a metaphor, she is implying a much closer comparison than if she uses a simile. As a reader, paying attention to this subtle difference can help you ascertain author’s purpose and better comprehend a character, scene, and so forth. As a writer, be aware of the fact that making comparisons through a simile or a metaphor can produce different effects. A metaphor creates a more direct comparison than does a simile. The choice you make as a writer depends on how close a comparison you intend to draw, or how close a relationship you want to create between the two subjects. When a writer employs a simile, she allows for a degree of separation between the items she compares. They are similar, alike–but not the same. By contrast, a metaphor essentially equates the items it compares. When a writer uses a metaphor, she is implying a much closer comparison than if she uses a simile. To see a visual representation of the subtle differences between simile and metaphor, please see this Venn Diagram. The maple featured above was my Climbing Tree during my time at Michigan State University. Though my four years as an undergraduate student were some of the best and most formative of my life, after I graduated, I could not imagine going back to school for a graduate degree. After I graduated from Michigan State University and began my teaching career in 2006, I could not imagine a single circumstance that would induce me to go back to school, especially while working full-time, but in 2009, I found myself itching to be a student again. I had noticed that since entering “the real world,” I was significantly less prolific in terms of the writing I was churning out, which had dwindled to the occasional diary entry. Before my entrance into the world of adulthood, I could usually fill an entire diary in a matter of just a few months, and would fill notebook after notebook with essays, poems, and stories. What had happened to me? Could I even call myself a writer anymore? I didn’t know. But I did know this: I missed writing, and I wanted to do it again. So I did what any rational person would: Put together a comprehensive writing portfolio and apply for admission to a master’s program for creative writing. I knew that with my demanding schedule, just wanting to write more would not result in actually writing more. But if I were part of a master’s program, and my grade depended on my carving out time for writing, and my reimbursement (a perk at work) for the costly classes depended on my grade, I would write. No matter how little time I had, I would write. Before my entrance into the world of adulthood, I could usually fill an entire diary in a matter of just a few months, and would fill notebook after notebook with essays, poems, and stories. What had happened to me? Could I even call myself a writer anymore? I didn’t know. But I did know this: I missed writing, and I wanted to do it again. My participation in a master’s degree program did indeed increase my writing motivation, inspiration, and productivity. It also benefited me in many other ways. If you are considering earning your MFA (Master of Fine Arts) or MALS (Master of Liberal Studies) in creative writing, I highly recommend it for the reasons that follow. Through the assigned readings in various graduate classes, you will be exposed to writers and literature you might not be inclined to pick up on your own, and you will grow as a writer and a reader from exposure to and study of every single one of them. I was enthralled with and enlightened by Tim O’Brien’s The Things They Carried, for example, and to this day would likely not have read a single page of it had it not been for the capstone project I completed in my degree program, which centered on the emotional truth as evidenced by both O’Brien’s and Ernest Hemingway’s works. I can guarantee I would not have read nearly as much flash fiction or prose poetry, and I certainly wouldn’t have attempted to write any. I owe those experiences and more to my graduate degree program. Assigned readings in various graduate classes will expose you to writers and literature you might not pick up on your own, and you will grow as a writer and a reader from this exposure. narrative essays, but your degree program is inevitably going to expand your grasp of the craft as it demands you experiment with fictional short stories, poetry, creative nonfiction, etc. Working towards a master’s degree in creative writing will open you up to types of writing you may not have even considered before–or been aware of. During my degree program, I wrote so many pieces I never would have written in so many genres I never would have tried. One of the most beneficial aspects of a degree program in writing is the supportive network the experience can help create. I began my program in 2009 and completed it in 2013, and now, as many as seven years later, I still communicate with several of my former classmates, even having recently embarked upon the creation of a blogging network with one of them. Most community colleges, colleges, and universities require their instructors to hold at least a master’s degree. In the world of writing instruction, a master’s degree and published works can sometimes be enough to at least get you noticed. If you don’t desire to teach at the college level, but do want to teach secondary school, for example, a master’s degree in a field related to your subject area equals a pay raise at most public schools. As an English teacher, I was granted a partial pay increase after I had completed a certain number of credits in my program, and was given the remainder of the increase after I earned the degree, which also qualified me to teach a college level dual enrollment composition class consisting of motivated and intelligent college-bound high school students. Although no agent or publishing house is going to require you to hold a master’s degree before they will consider working with you or reading your work, it does lend you credibility on your resume and in your query letter. One element of a query letter is accolades–published works, involvement in writing organizations, writing awards and recognition, etc. A master’s degree in writing is something else that bodes well for you here. It shows you take your craft seriously, are dedicated to your writing, and have a solid background in the field. This one is probably a bit obvious: The more you write, the better you write. For this reason, enrolling in a master’s program in creative writing will no doubt help you improve your craft. You will have the benefit of feedback from published authors, fellow students, seasoned writing instructors, etc. Not only will you be writing on a regular basis, but you will be revising and polishing your writing on a regular basis, becoming more self-aware as a writer and as a reader. The more you write, the better you write–and a master’s program that requires you to write can’t hurt your cause. If you don’t have the desire to enroll in a degree program, but still need help finding time to write, check this out.